Meryl Streep and Lily Tomlin did a snappy banter bit at this year’s Oscars before they presented the lifetime achievement award to director Robert Altman. The whole performance was an homage to Altman and his films. Fast, seemingly improvised dialogue is his trademark. Well, that and having large, talented ensemble casts. The ony other Altman film I’ve ever seen is Gosford Park, and I enjoyed that immensely. Too bad I can’t give the same praise to A Prairie Home Companion. 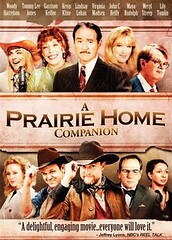 The movie A Prairie Home Companion is little more than an episode of the radio show. And not a particularly interesting episode at that. To be fair, I’m not a fan of the radio show. This isn’t to say I don’t like it. I do. I just don’t go out of my way to catch it. True fans do. True fans know precisely what time it comes on public radio and keep their schedules free so as not to miss it. That’s not me. I’ll listen to the show if I’m in the car and I don’t have an audiobook handy, but not otherwise. When I DO listen, however, I enjoy it. I find Garrison Keillor comfortably charming and can’t help but smile at his Guy Noir bits or his off handed recollections of growing up on Lake Wobegone. And I guess that’s why I was so disappointed by the movie. Unlike the radio show, it just wasn’t funny. Sure, it had a few chuckles here and there, but most of it was boring. Garrison Keillor, bless his heart, is a radio actor, not a screen actor. He’s got no film presence. No measure of that special Hollywood … something. No million dollar smile. In fact, he doesn’t even have a one dollar smile. His only expression is a deep, somber frown. I’m not exaggerating. Happy, sad, remorseful. It’s all the same long face. He’s No Emotion Man. Kevin Kline, on the other hand, was fun as Guy Noir, although the filmmakers’ decision to use Noir as the theater security detail instead of as his true pulp detective self on some mysterious assignment was a huge mistake. Woody Harrelson and John C. Reiley as slightly off-color singing cowboys gave the movie its only real laughs. Their song about dirty jokes had Lauren and I rolling. Virginia Madsen played an angel character that made no sense whatsoever. She could be seen by some people, but not others. And the ones who COULD see her didn’t seem the least bit bothered by her being there. I mean, what stage manager would tolerate a stranger strolling around backstage unescorted? What’s worse, no one batted an eye when they found out she was an angel. HELLO! If someone tells you she’s an angel, you’re going to have a reaction, whether you believe her or not. The Special Features showed some making-of documentaries, but they weren’t anything to write home about. I WAS intrigued by Robert Altman, however. He died recently, so I wasn’t surprised by his old and fragile appearance. In the documentaries, he was almost always sitting on set, and when he did move around, it was with a slow, measured shuffle, as if he feared falling over with every step. Garrison Keillor wrote the screenplay, and the plot, if you can call it that. The premise was that the theater had been sold and this was the last performance of the program’s successful thirty-year run. What was odd was that no one seemed particularly broken up about this fact. Only the sandwich lady showed any emotion over it. No one else seemed to care. And if the characters don’t care, why in the world should I? Perhaps I’m too accustomed to movie conventions. Or maybe I’m too uncultured, incapable of recognizing the genius that is Robert Altman. Either way, A Prairie Home Companion is a film I’ll soon forget.